Jason Burress is a 7th generation Texan who earned his law degree from the Southern Methodist University School of Law. While attending SMU Law School, Jason clerked for the Honorable Justice Jim Moseley at the Fifth District Court of Appeals. Jason was also very involved in mock trial competitions and earned the Dean's List multiple times. Upon graduation, Jason joined Hartline, Dacus, Barger, Dreyer & Kern, a prominent Texas based law firm. Over his career, Jason has managed hundreds of high-stakes cases involving personal injury and wrongful death with millions of dollars at risk. 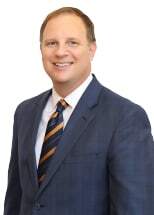 He previously served as trial counsel for numerous mid-size and Fortune 500 corporations including General Motors, Freightliner, AIG Excess and Casualty Level insured companies, Nissan Motor Company, Boston Scientific and Conoco-Phillips. Since founding Burress Law PLLC, Jason's practice has shifted from defending insurance companies and product manufacturers to representing people who are injured or have lost loved ones due to someone else's negligence. Jason dedicates his practice to helping serious personal injury victims of catastrophic 18 wheeler crashes, motorcycle wrecks and car crashes as well as victims of drunk drivers and dangerous or defective products.